Artist Profile videos for Alternative Cosmos! Opening Reception Feb 6th, 6-8pm!! Lady Saphire reinvents the world through works made from melted plastics, resins and trash remnants that are unusually striking and oddly familiar. Get to know her before the show by checking out her artist profile video above! Solis invites us into the graphic universe of Wildwood, where characters made from reclaimed materials spring to life and provoke questions of togetherness, tolerance and utopian ideals. Get to know him before the show by checking out his artist profile video above! Alternative Cosmos at the Reclaimed Room features work by artists Solis and Lady Saphire. Both artists, in their own ways, create new spaces of engagement through their individual art works and compliment one another quite gracefully. This show delves into the other worlds that exist right before our eyes and these artists bring those alternative cosmos-es to life in our next show. Save the date! As always, snacks and drinks are provided and the admission is FREE! 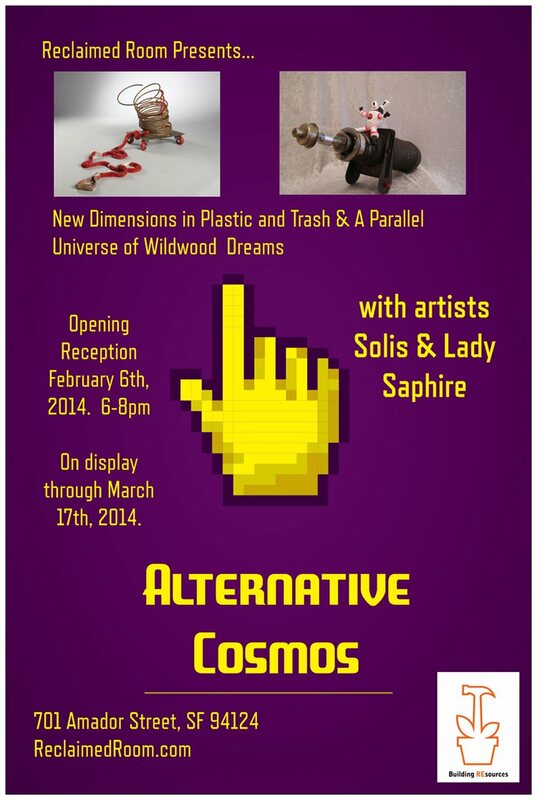 Alternative Cosmos opens Feb 6th! We are excited to announce details of our next new show, Alternative Cosmos, at the Reclaimed Room. This show features work by artists Solis and Lady Saphire. Both artists, in their own ways, create new spaces of engagement through their individual art works and compliment one another quite gracefully.